In the 1850s, a growing and confident Leeds Baptist church life was centred on the huge original South Parade building in the city centre. 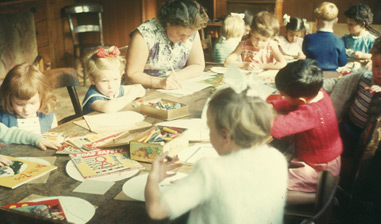 A fund was started to enable a move out into the suburbs, and HLBC was one of several planned church projects. 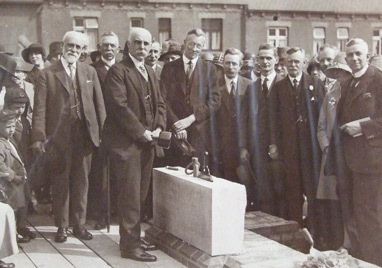 The foundation stone for the school and community rooms (schooling was considered the priority), was laid in 1906. The first service was held on the new site in 1907, with the new school hall doubling as a chapel until the rest of the complex could be completed. In spite of horror and loss during the First World War, church membership had bloomed by the 1920s. The final part of the original planned building complex, the chapel, was able to go ahead. It was opened in 1929, now including a memorial to those who had fought and died in the war. The church always welcomed the surrounding community into the buildings. Activities have included Scout and Guide groups, cricket and gym teams, drama and debating societies, many varieties of Sunday Schools, playgroups, holiday and youth clubs. And activities that began with hospital visits during WW1 and campaigns for disarmament in the 1920s could be seen as predecessors for our current interests in justice and social issues. As in the wider church, different decades have had different theological, worship and leadership emphases. Each has enriched our history – sometimes change has been difficult and led to painful partings, other times have been celebrated and rejoiced over. We are thankful for this history – people, prayer, faithful ministers, buildings, stories of faith – and pray that we serve the Lord fruitfully in the next hundred years. We have a lot of info and records relating to the history of HLBC, much of which is kept in the Leeds Archive. If you would like to know more, or are looking for details of a particular event or person, please contact the Church Office and we will try to help.